How much a leader earns may depend, at least in part, on whether they look the part. New research from Laura Fruhen (University of Western Australia) found that people were willing to offer higher salaries to job applicants when they possessed certain facial characteristics. It’s been long established that more attractive people tend to receive bigger paychecks, but Fruhen, along with colleagues Christopher Watkins (Abertay University) and Benedict Jones (University of Glasgow) found that a trustworthy or dominant-looking face may also lead to a sizable bump in salary. “We worked out that over the course of a 40-year career, an income advantage of between $11,000 and $26,000 could be achieved just based on having particular facial features,” Fruhen explains. 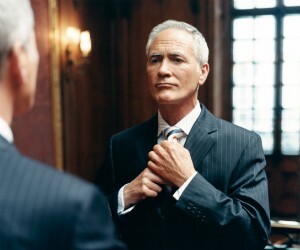 Studies suggest that people tend to be consistent about which faces look more, or less, leader-like. Evolutionary psychologists Mark Van Vugt and Allen Grabo argue that evolution has hardwired humans to choose leaders based on specific physical criteria that can infer good leadership qualities. “Because such cues were reliably associated with leadership success in ancestral human environments, they continue to affect people’s attributions of leadership today,” they write in a new review published in Current Directions in Psychological Science. For example, more masculine faces—characterized by features such as a squared face, strong jawline, pronounced eyebrows, and thin eyes and lips—are typically judged as more dominant. Dominant-looking individuals are more likely to be judged as leaders, but they’re also rated as appearing less trustworthy. On the other hand, stereotypical “feminine” features such as a round face, big eyes, small eyebrows, and full lips—tend to cue associations of trustworthiness. Following this theory, Fruhen and colleagues hypothesized that people would prefer leaders with facial features associated with dominance and trustworthiness. However, when it comes to making a sale in a retail shop, more attractive individuals might have an edge. To test this, the researchers asked 1,432 participants in an online experiment how much they’d be willing to pay an individual, based only on their photograph. Some participants were told that they were assessing job candidates for a retail sales position, while the others were told they were looking at potential senior managers. For the sales applicant working the shop floor, participants could select a salary between £23,000 and £29,000 (about $36,000 to $43,655) per year. Participants could choose to offer the senior manager a salary from a range of £83,000 to £89,000 ($125,000 to $134,000). The set of 100 photos (50 men and 50 women, all Caucasian) came from a public database. In a separate experiment, the researchers had 1,200 people rate each of the 100 faces on a 7-point scale for either attractiveness, dominance, or trustworthiness. The researchers calculated just how much of the average salary for each photo could be attributed to their scores on dominance, trustworthiness, and attractiveness. As expected, this “pay premium” depended largely on what job the individual was applying for. Employees applying for a sales job benefited the most from when people thought they had an attractive face – adding an average £238.02 ($361.79) pay premium to their salary. Managers, however, benefited most from facial cues of trustworthiness (£275.70; $419.06) and dominance (£233.65; $355.15). The highest premium overall was awarded to trustworthiness in male faces (£302.10; $459.19). It’s important to remember that just because someone might look trustworthy or dominant, doesn’t mean their behavior will live up to expectations set by their face. Fruhen and colleagues suggest that organizations should take steps to reduce potential bias by removing photographs from CVs. With the proliferation of sites like LinkedIn that often use a photo, they suggest that job seekers choose a photo that plays up the traits that best fit with the job they’re looking for.